Member States of the World Health Organization (WHO) are about to elect a new Director General (DG) to lead the organisation in a world characterized by mounting challenges with profound health implications – political uncertainty, growing nationalism and shrinking democratic space, climate change from widespread pollution, wealth concentration and rising inequalities within and between countries, incoercible migration flows, structural violence, among others. The WHO Executive Board who met from 23 January to 1 February shortlisted three candidates, one of whom will be elected DG for the next five years, through a secret ballot at the upcoming World Health Assembly in May. As civil society organizations (CSOs), we have no direct role in deciding who will lead the WHO into this uncertain future. Yet, we are fully aware that actions of the new DG will have an impact on everyone. This scenario makes the question as to what criteria will determine the result of the vote a compelling one. Will WHO Member States make their choice based on the public institutional needs of the organization and the merits of the candidate? Or will the great game of geo-politics and other policy interests and motives play a determining role? WHO is at a crossroads: at stake are its credibility, legitimacy, and capacity to play the directing role in matters of international health. We call on governments to select the future DG based on objective consideration of the candidate’s vision of the common good and the public interest. We ask member states to scrutinize each candidate’s individual capacity to tackle the requirements of the organization. This means carefully screening the future Director General through the lens of public health, orientation towards global health equity, and ability to reclaim the role of the WHO as the principal authority to direct and coordinate global health. Sets priorities and decides on strategy implementation from a global public health perspective, rather than being guided by individual donor interests and priorities. Recognizes and embraces public-interest civil society organizations, recognizing the value of their role in fulfilling Article 1 of its Constitution (the “attainment by all peoples of the highest possible level of health”) in their interaction with Member States at various levels. – challenge Member States to address global public health challenges, and adopt appropriate public policies in all fields, independent of commercial or political interests. We remain committed WHO supporters and advocates and see the time for profound WHO authority and leadership as now. Absent such change, the WHO risks becoming irrelevant in coming decades. What will remain is the façade of a once grand space where, on close inspection, little of substance happens anymore. That is an avoidable tragedy for large and small states alike, signaling the end of meaningful global health rights and policies. Comments on this statement are most welcome. Send them to us via e-mail or publish them directly on this page. Before being able to submit comments on the G2H2 website, please register as a user – and get back to this page afterwards! 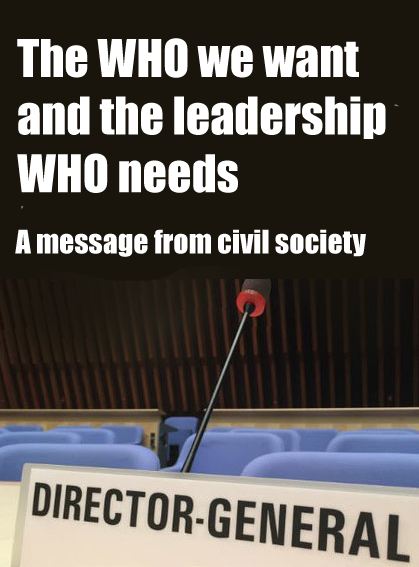 The civil society message “The WHO we want and the leadership WHO needs” has been drafted as a follow-up to the civil society strategy meeting “WHO Governance: Many open questions” on 21 January 2017. The message and an initial list of endorsements were first published on 6 March 2017, the day of a discussion meeting with the final three WHO DG candidates at the Graduate Institute, Geneva. The drafting and dissemination of the statement has been facilitated by G2H2, as a service to its members engaged in this process. Endorsements by 6 March 2017 (final).